Yong-Hu and Ho-Shing walked through the valley. "I’m getting tired," Yong-Hu complained. "Where are we going anyway?" he asked. Ho-Shing stopped and turned to face Yong-Hu. "We are going to find a city, a lost city. I have heard great tales about it. There are wondrous surprises that awaits the ones who find the ancient city." "Does anyone live there? Are there people there?" Yong-Hu asked. "Not anymore. At one time it was the busiest city in all of China. Nobody lives there now," Ho-Shing explained. "Because it is too far out of the way for the trade routes. People want to live near the cities these days, not far into the mountains in remote locations," Ho-Shing explained. "What kinds of surprises are there? Good surprises?" Yong-Hu asked. "Magical surprises," Ho-Shing smiled. "Come. We must continue and reach the safety of the lost city before nightfall." "You ask many questions, Yong-Hu. I don’t want to frighten you, but there are many tigers in these mountains. We must reach the city. Come," Ho-Shing said. He turned and started walking. "This is a lot of climbing for two panda bears. We should be sitting in the bamboo right now, eating until our tummies are full. Is there bamboo in the lost city?" Yong-Hu asked. "Good. Let’s hurry up then. I’m starving," Yong-Hu giggled and quickly followed the other panda. After several hours, Ho-Shing stopped. "See the mountains ahead? We are nearly there. Another hour." Just then they heard a growling sound. "What was that?" Yong-Hu asked. "A tiger, but it isn’t near us. Its roar is echoing off the tall mountains. Don’t fear. We’ll be safe soon," Ho-Shing said, comfortingly. "There it is! There is the lost city! We have found it at last," Ho-Shing smiled. "It is magnificent, Ho-Shing. The walls are high and the roofs of the buildings sparkle in the sunshine. Are they made of jade?" Yong-Hu asked. "There is much jade, ivory, gold, silver, and even rubies. We must hurry," Ho-Shing said. They stood at the bottom of the wall. It was as high as the tallest trees they’d ever seen. "How do we get inside?" Yong-Hu wondered. "We must climb these steps," Ho-Shing said, pointing to very steep steps that led to the top of the wall. "Gulp! I don’t know if I can climb that high," Yong-Hu feared. "Inside you will find all the bamboo you can eat," Ho-Shing tempted. "What are we waiting for? Let’s go!" Yong-Hu laughed and ran up the stairs. After he’d climbed twenty of them he stopped and took a few breaths. "I think I’ll walk slowly up the rest of them." Ho-Shing merely smiled and continued his climb. When he reached the top he waited for Yong-Hu. "I’m coming," he shouted from below. "Don’t go and eat all the bamboo. Save some for me." Ho-Shing looked at the city. The rooftops were green and seemed to dance in the crisp, cold air of the mountains. 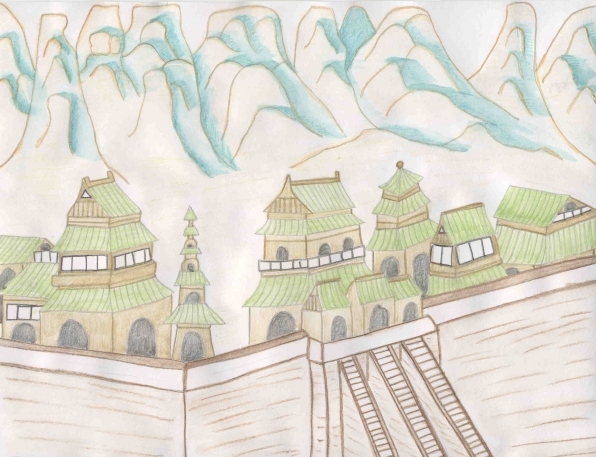 The walled city was everything he imagined. "Ah, there is where we need to go," he said to Yong-Hu as he reached the top step, "over there, in the middle of the city." "Is that where the bamboo is?" Yong-Hu asked. "Bamboo grows everywhere you look. That is where we shall find our surprises," Ho-Shing said. They climbed down the steps on the other side of the wall. "This is much easier," Yong-Hu laughed. "We need to treat this place with much reverence. Be quiet. Don’t touch anything until I say so," he warned his friend. When they reached the center of town, they came upon a small shrine. A huge, golden gong hung from poles. Several Chinese statues of lions surrounded it. "Look at their ruby eyes!" Yong-Hu said. "Can I bang the gong?" he asked. "Yes. We have to let the spirits of the past know that we have arrived," the wiser panda said. Yong-Hu picked up the stick and hit the gong. It clanged and echoed back and forth from mountain to mountain. He had to put his hands over his ears, as it was too loud. When the noise stopped, silence filled the air. Crickets began to chirp and sing a melody. "Listen," Ho-Shing said. "It is beautiful." "When do we get the rubies and jade," Yong-Hu whispered. Ho-Shing ignored him and listened to the magical music of the crickets. Yong-Hu didn’t say another word. The two pandas stood silently for an hour, until the crickets stopped singing. "Our surprise?" Yong-Hu whispered again. "Yong-Hu, that was our surprise. Nobody in the world has heard anything that beautiful before. It is our reward for our journey," Ho-Shing said. "What about the jade? What about the gold, silver, rubies and ivory?" Yong-Hu asked. "We cannot touch these things. They belong to the people who lived once in this lost city. You can eat all the bamboo you want, but the rest must stay within these walls," Ho-Shing explained. At the mention of bamboo, Yong-Hu forgot about all the precious jewels and riches. "Bamboo!" He ran off to search for his feast. Ho-Shing found him a few hours later. "Are you full, my friend?" he asked. "Have some. It is the most delicious bamboo you will ever try," Yong-Hu said. "We shall eat and tomorrow we shall leave and head back to the river," Ho-Shing said. The two pandas spent the night in the lost city. When the sun rose over the walls, they walked up the steps and down the other side, leaving the magical place behind them.